An eternity ring has become the most popular wedding anniversary gift as well as wedding band design. The never-ending diamonds represent unwavering love, commitment, and faithfulness. deBebians carries an outstanding collection of well-made eternity rings that come in different setting types, precious metal options, and diamond qualities. 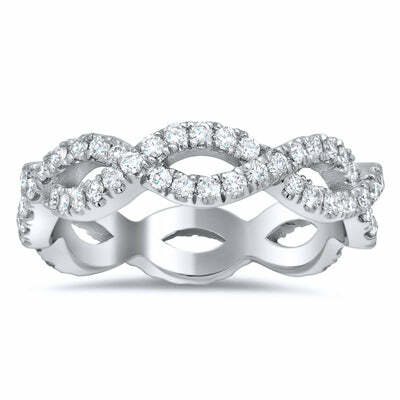 Our customers adore every style of eternity band that we offer, but I wanted to share a few of my personal favorites. Please view our entire collection of diamond eternity rings to view our complete assortment. This single row pave eternity ring is completed with milgrain detail. Milgrain detail mimics the look of small, metal beads that surround the outer edges of a ring. This ring has a 2mm width and is set with 0.50 cttw of sparkling diamonds. 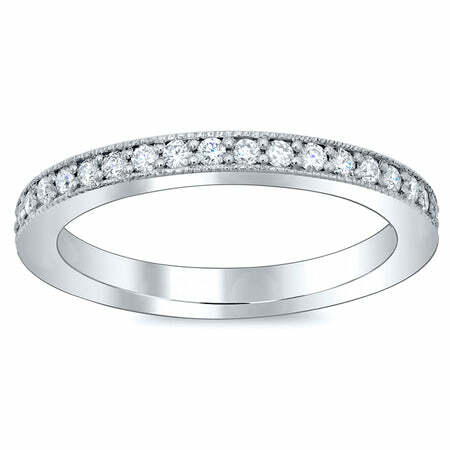 This eternity ring is one of our most affordable pieces and currently starts at $870.00. An infinity eternity ring has quickly become a popular choice due to its unique look. This ring will sit beautifully next to an array of different types of engagement rings. This ring may be purchased in 14 kt gold, 18 kt gold, or platinum. This ring currently starts at $2445.00. If you would like some wedding band inspiration, please visit our recently purchased eternity rings page. If you are trying to match one of our eternity rings to an engagement ring, please contact a deBebians jewelry expert or GIA graduate gemologist at your convenience. We specialize in creating every type of custom jewelry and would love to create a bespoke anniversary ring or wedding band just for you or for someone you love.